Fundamentally this hardware-based approach is strongly favoured by broadcasters and live event teams because of its inherent reliability. In the unlikely event of failure the inevitable turn it off and turn it on again typically resolves any issue within seconds. Compare this with the process of rebooting a computer-based mixer and youll appreciate why hardware trumps software in live, mission critical situations. Because of this fear of failure, developers have innovated slowly and methodically. Blackmagic Design was one of the first to inject new energy into the sector with its ATEM switchers which have proven to be incredibly popular with users everywhere from the BBC to start-up webcasters. One of the reasons has been the option to control the hardware via a software interface. Installed on a touchscreen laptop or a tablet computer, its very affordable, stable and intuitive. However, theres much more to it than the low price (from well under £1,000). With the ATEM range you can have multiple operators all working on the same programme at the same time. For example, operator one switches between camera angles and recorded clips, the second controls the Studio Cameras settings, the third mixes audio with a forth creating and organizing graphics and titles. All this can be achieved using four laptops and a single low profile ATEM base unit. Until recently, vision mixing has been a very local affair. While the cloud has started to impact on media archivists and remote editing teams, it still plays a very limited role in live production. The chief reason for this is latency. Cutting between live sources (camera one to camera two etc.) requires accuracy and the ability to monitor video feeds and previews on a multiviewer in real-time. Until now this has been a very costly exercise, with SDI signals and control signals transmitted expensively over anywhere between 5 and 20 individual cables over a maximum distance of around 75 metres. Is this an issue? Yes. In corporate environments or venues, no facilities manager is going to allow holes to be drilled through the walls of meeting rooms or conference suites for bundles of cables. In schools and universities there is no budget for extended lengths of SDI cable, and production teams cannot be placed in each classroom or demo theatre. The solution is to install a low cost switcher unit (sub-£1500) near the cameras and control the video mixing remotely using the existing Ethernet network. 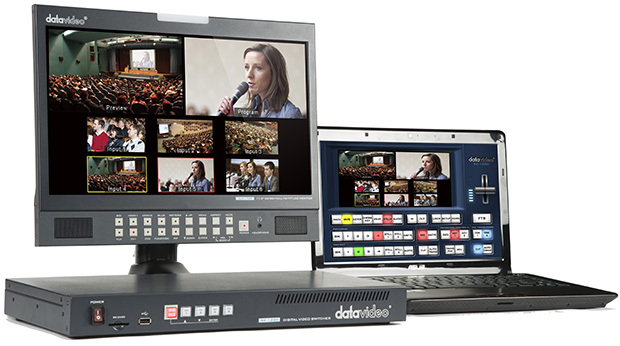 The new Datavideo SE-1200MU is the first to offer this functionality. With the device, the multiview output is converted to low bandwidth MJPEG and streamed over IP, along with control signals. Using a remote PC or laptop, the director can view each camera feed, preview effects and produce the programme with virtually no impact on the IT network and no need for new cabling. Its a very elegant solution and a real breakthrough. With Teradek, revolution is always in the air. The Live:Air app is the worlds first iPad-based vision mixer. It takes the feed from multiple cameras (encoded and sent over WiFi by one of its Cube or VidiU devices). The device then allows the user to mix and switch sources, add titles, graphics and effects, then stream the programme live over the Internet via Livestream and similar content networks. Its true vision mixing on the run, with no cables, no recorder, no CG workstation or sound mixer. Who said vision mixing was steady business?